The online version of this article ( https://doi.org/10.1186/s40168-018-0564-7) contains supplementary material, which is available to authorized users. Pediatric asthma is the most common chronic childhood disease and a major public health problem in the USA, currently affecting 9.3% of the children (~ 7.0 million), and prevalence continues to rise [1, 2, 3]. Prevalence is particularly high (13.9%) in Washington, DC, mainly among African Americans , who nonetheless still represent one of the least studied ethnicities with regards to asthma . Childhood asthma is the third leading cause of hospitalization (137,000 cases) among US children, accounting annually for 640,000 emergency department visits [5, 6]. It is also a major cause of school absenteeism (~ 14.4 million lost school days/year) , and treatment cost is estimated at $3.2 billion/year [8, 9]. Pediatric asthma is recognized as a complex condition with differences in severity, natural history, comorbidities, and treatment response [10, 11, 12, 13]. A longstanding debate is whether pediatric asthma (and asthma in general) is a single disease with a variable presentation or several diseases that have variable airflow obstruction as a common feature. Wenzel  proposed that the different phenotypes expressed by patients with asthma are partly dependent on different disease processes in each individual. Thus, the diagnostic label “asthma” likely encompasses many different disease variants with different etiologies and pathophysiologies [10, 11, 15]. Typically, a child’s asthma is described in terms of disease phenotypes, which summarizes observable characteristics (clinical, physiological, morphologic, and biochemical), as well as the response to different treatments; thus, they are clinically relevant in terms of presentation, triggers, and treatment response. Asthma phenotypes have long been described by clinicians from their own practice experience, but now are better characterized by applying clustering approaches to patient clinical information collected from cohorts of asthmatic patients (i.e., asthma phenotypic clusters) [16, 17, 18, 19]. Using hierarchical clustering, for example, our group has distinguished in a previous study three phenotypic clusters of pediatric asthma in a cohort of children and adolescents from the Washington, DC area (The AsthMaP Project) . The application of novel culture-independent techniques of Next-Generation Sequencing (NGS) has already demonstrated that bacterial communities living in the respiratory airways play a significant role in the onset, development, and severity of asthma [20, 21, 22, 23, 24, 25, 26, 27, 28, 29]. Moreover, microbiome research has also shown that the nose is a major reservoir for opportunistic pathogens [30, 31], which can from there spread to other sections of the respiratory tract and potentially cause asthma, but also otitis media or pneumonia, or invade the bloodstream to cause sepsis and meningitis [27, 28, 32, 33, 34, 35, 36]. The relationship between airway microbiota and asthma phenotypes is still poorly understood [37, 38, 39]. A few studies have explored the interaction in adults [37, 38] and have shown significant variation in microbial diversity and the abundance of pathogenic taxa across asthma phenotypes. Whether differences in the composition of microbial populations (pathogenic and commensal) could contribute to asthma in children and adolescents remains to be determined. Defining the relationships between pediatric asthma phenotypes and nasal airway microbiota could ultimately inform our understanding of asthma pathophysiology and could help identify prognostic markers [18, 37]. The nasal microbiomes across all 205 samples included sequences that corresponded to five dominant (> 1%) Phyla: Firmicutes (37.8), Proteobacteria (36.3%), Actinobacteria (11.1%), Bacteroidetes (8.2%), and Fusobacteria (3.5%) (Fig. 1). Those Phyla comprised 10 dominant (> 1%) genera: Moraxella (28.3%), Staphylococcus (17.8%), Corynebacterium (10.1%), Dolosigranulum (7.7%), Prevotella (5.5%), Streptococcus (5.5%), Fusobacterium (3.3%), Haemophilus (3.2%), Neisseriaceae sp. (1.4%), and Peptoniphilus (1.2%) (Fig. 1). All the other detected genera accounted for < 1% of the total 16S rRNA sequences each. Each of the 205 nasal microbiomes contained 3 to 10 (mean = 7.8 genera) of the dominant bacterial genera. All these genera are commonly found in the nose of infants and adults with and without asthma, although in different proportions [24, 25, 26, 27, 28, 29, 33, 34, 36, 60, 61, 62, 63, 64, 65, 66, 67]. Nonetheless, previous studies [25, 68] have also revealed that the nose includes microenvironments containing microbiotas with different diversity and structure and that nasal washes may only capture part of that diversity. Hence, the diversity and complexity of the nasal microbiome is probably larger than what we show here. The nose is the major ecological niche for potential pathogens that cause lower respiratory infections such as asthma [23, 24, 27, 28, 30, 31, 34, 36, 60]. All core microbiome genera (Fig. 1) we detected in the nose (Moraxella, Staphylococcus, Streptococcus, and Haemophilus) include opportunistic pathogenic species of the airways [73, 74]. Other population-based microbiome studies of the lower and upper respiratory airways (excluding the nose and nasopharynx) have also shown enrichment of these genera in asthmatic infants, children, or adults [20, 34, 75, 76, 77]. Thus, our results confirm in children and adolescents the potential role of the nose as a reservoir of pathogens for other sections of the respiratory tract [23, 29, 34]. The relationship between airway microbiology and asthma phenotypes is still poorly understood [37, 38, 39]. Here, we investigated if unbiased phenotypic clusters of pediatric asthma and clinical, physiological, and biochemical characteristics were associated with nasal bacterial diversity. 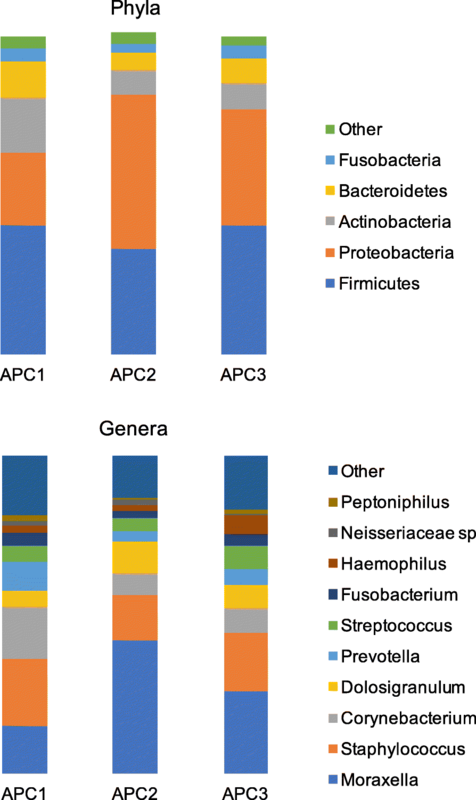 Microbial profiles of some of the most abundant bacterial phyla and pathogenic genera associated with asthma (e.g., Proteobacteria and Moraxella) varied significantly (LME, P < 0.05) across pediatric asthma phenotypic clusters. Similarly, both alpha-diversity (Shannon index) and beta-diversity (UniFrac weighted, Bray-Curtis, and Jaccard distances) estimates revealed significant differences (Table 3; LME, P < 0.05) in the composition (abundance and evenness) and structure, respectively, of the microbial communities of the three asthma phenotypes. 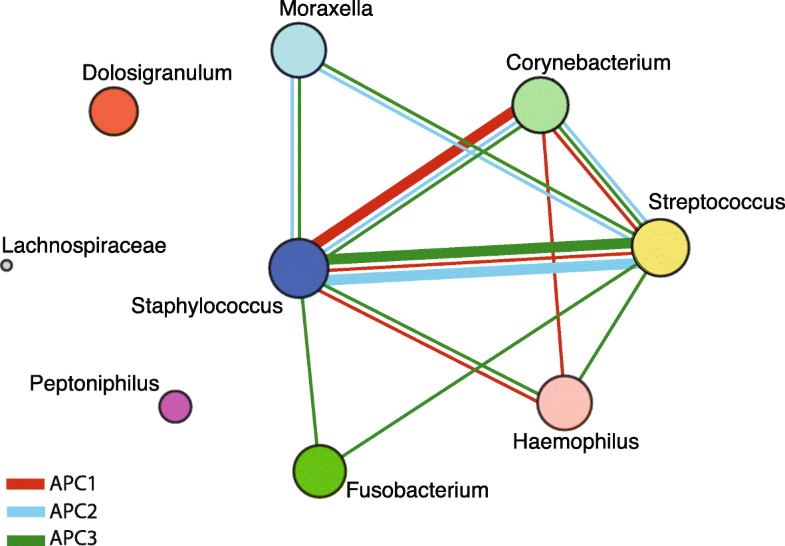 Additionally, microbial co-occurrences (as indicated by our network analysis) among dominant bacterial members also varied across asthma phenotypic clusters (Fig. 2). This likely reflects different symbiotic interactions between pathogenic and commensal bacteria in the nose as seen in other respiratory diseases [65, 78]. Nonetheless, taxa co-occurrences as described here, do not necessarily reflect functional relationships. Further studies, focusing on the functional capabilities these taxa display within the nose (e.g., via RNASeq analyses, see ) are needed to determine if these bacteria truly contribute to symbiosis during asthma. Preterm birth was significantly associated with variation in microbiome diversity and abundance of several microbial taxa. Individuals born prematurely undergo dramatically different early-life exposures in the neonatal intensive care unit (NICU). Prematurity-related challenges include nosocomial pathogens, supplemental oxygen, mechanical respiratory support, broad-spectrum antimicrobials, and deprivation of the normal intrauterine environment. Previous studies have shown that the airway microbiome may also play a role in post-natal problems faced by premature infants [73, 81]. A recent study has shown that the NP microbiota of premature infants is altered relative to that of infants born at term and that those changes persist during at least early childhood (6 months to 2 years) . 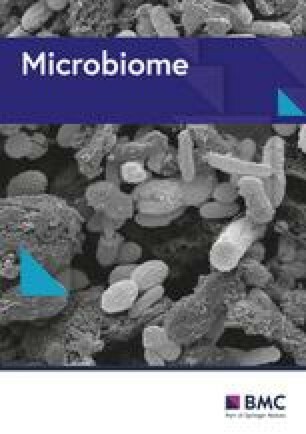 Microbial dysbiosis may play an important role in modulating airway inflammatory and immune responses . Indeed, previous studies have established that the early nasal and nasopharyngeal microbial composition correlates with individual frequency and severity of upper and lower respiratory infections as well as subsequent risk of developing asthma [27, 33, 84, 85, 86]. Our results suggest that nasal microbiome changes acquired by preterm neonates may persist into adolescence. Future longitudinal studies will be needed to further investigate the interplay between preterm birth, nasal microbiota, and the development of airway immune responses against respiratory pathogens in early life.